My favourite open source WYSIWYG HTML editor has always been Nvu. However, it had several bugs and often crashed in the middle of a web desiging job. 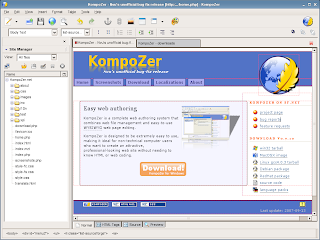 I was really happy to learn that there's a community-driven project called KompoZer. It maintains Nvu's codebase and fixes several bugs. You don't need to have any knowledge of either HTML or CSS to use the software though it would be better.